There are some tactics and techniques to survive on Youtube and to boost your channel. It is the strategy that changes everything you do on Youtube. So, a right approach is the main key to your YouTube channel success. Building of Video Editorial Calendar has been explained here. Along with the strategic plan, the most crucial thing is time management. Yes, management of time is imperative as everything must be scheduled. For video editors and creators, planning is paramount to your success. What is this Editorial Calendar? What did a good editorial Calendar consist? There are some tactics and techniques to survive on Youtube and boost editorial calendar that helps you to increase the productivity. It is a complete plan for your Youtube channel strategy. It contains daily upload information and monthly topics for your Youtube channel videos. You can create a final structure for your Youtube channel videos that are to deliver to your audience. You can also arrange the things and plan weekly and monthly. It is conducive to reach your objectives and goals that you made on your Youtube channel. The scheduling of the tasks in the calendar is the right way to achieve your strategy and implementation of the strategy perfectly to get a good outcome. Many channels have a great strategic plan that can enhance the rate of productivity of their YouTube channel. But when comes to implementation of such plan or strategy after the creation, it was a big failure due to the lack of proper execution and schedule to implement. So, an editorial calendar is very helpful to fetch real productivity with proper planning that supports the implementation of your strategy. Well, we are at the right point of our discussion. Let us know the trademarks of a good editorial calendar that can boost your productivity. The editorial calendar helps you to bind your strategy with your team. The information must be accessible to your team members such as the publishing date, title and the author details are very important to schedule and share with the team. So they can know the exact status of the particular videos and the schedule of video posting or delivery. By using the editorial calendar, you can make a protocol before publishing your content. The publishing protocol must be available for your team, and an editorial calendar is the best place to share these things. Teamwork is a vital element that can fetch good benefits to your efforts. The workflow is the main thing in teamwork and it’s all about who is working on which project accordingly to the flow chart or the workflow that was decided to be done in a given strategic plan. Information sharing must be in a clear way whereas the files, documentation, and links whatever your team must need should be accessible to everyone in your team. It could be a Word document or a Google doc links whatever it may be the things must be outlined and shared using the Editorial Calendar. You must also fill the details about the content and its owner and responsibilities of editing duty and approval duties in detail. Then only your team can understand the funnel you are going with to boost your channel on Youtube. A detailed checklist for the promotions can be created on an editorial calendar where your team can check the things about promoting the content which can prevent the duplication. So, your editorial calendar must be a collaborative one as everyone in your team must collaborate with their current status of work. So, anyone can share ideas and can suggest the best date for publishing and can fix the things in a right way with the good workflow. Visualize the deadlines that are to be followed by your team and simplify the project to make your team on track. You can also schedule and reschedule the tasks in an easy way. It can encourage the consistency of the work in a team. Your editorial calendar must be an action plan to your team. It must cover the things like publishing date and the rough draft status on whether the edits or completed or not and more details about the tasks and the significant milestones and it should be like action plan that should reflected in the editorial calendar. The Spreadsheet is also a good editorial calendar in which you can track the articles and channels, detailed metrics in the editorial calendar which helps you to track your schedule and it is the most customizable one. • Enhance good team workflow with the definitive strategic planning with the editorial calendar. • You can track the things about the teamwork status along with the publishing dates and promotion status. • It helps you to boost your channel productivity. • It is beneficial to focus on the attention and prospects of your channel to boost productivity. • It helps you to maintain consistency across the multiple projects with ease. • Scalability is the most beneficial thing that you can avail from this calendar as you can increase the efficiency of the workflow and thus increase the productivity level of your project. • The scheduling and plan sharing helps you to go with a clear workflow that can support your planning and strategy. After following all these strategies and must be implemented at your channel without being late. The implementation of these in the real-time will engage the YouTube channel with huge traffic. 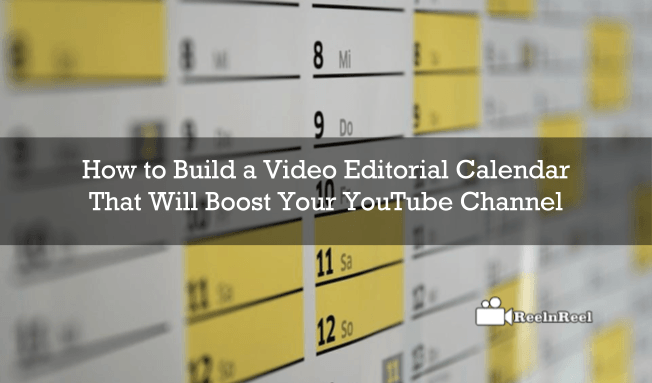 Therefore, the editorial calendar is the best way to increase your channel productivity by making your workflow in a standard way to reach your goals and objectives. So, start utilising the editorial calendar to boost your productivity.So why you are wasting time just go on applying at your YouTube channel.